M.T. Caracciolo, Giuseppe Cades, Paris, 1992, no. 49 C, illustrated. One of three drawings in the shape of a frieze, most probably designs for wall decorations depicting mythological scenes in which Athena plays a central part. 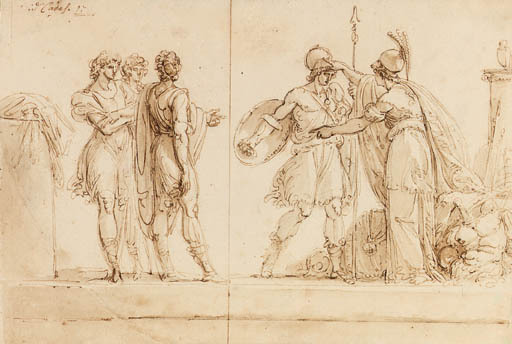 Another drawing represented a scene from the story of Arachne, while the present one may relate to an episode in the Iliad, when the goddess exhorts a young Greek warrior.